Every year gardeners injure their eyes on uncapped canes and bamboos. 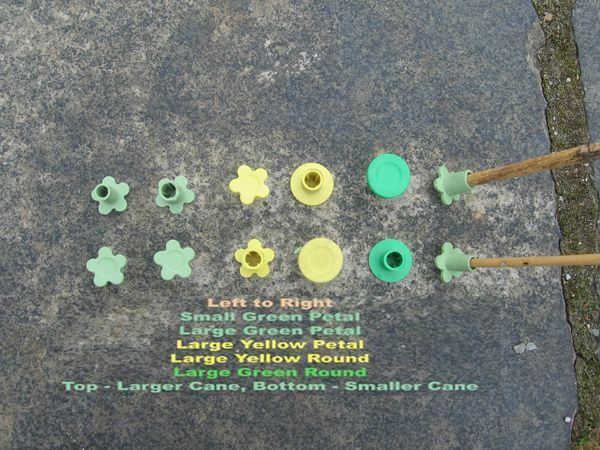 For a very small price these soft squidgy green or yellow rubbery tops will protect two of your most priceless assets. The diameter of the round green or yellow across the top is 3.3 cm and the green or yellow petal is 3.0 cm. The large or small refers to the size of the opening for the cane - large grips from approx 6mm to 12mm and small from 4mm to 8mm. NB.1 - As from November 2016 the small and large green petals only come in the stronger shade of green identical to that of the large green round. The even mixes are only available in box quantities. NB.2 - As from November 2016 - large yellow petals not available for the foreseeable future. Large round will be substituted in their place.